Joseph J. Kaspar, an Emmy-winning NBC television engineer, spent years researching the 1947 Ringling Bros. and Barnum and Bailey Circus train. He collected 1105 photographs. Remarkably, he also obtained the original conductor’s notebook listing all the cars and what they contained. He then proceeded to build an HO scale model of the train, handcrafting everything, even the passenger car windows. 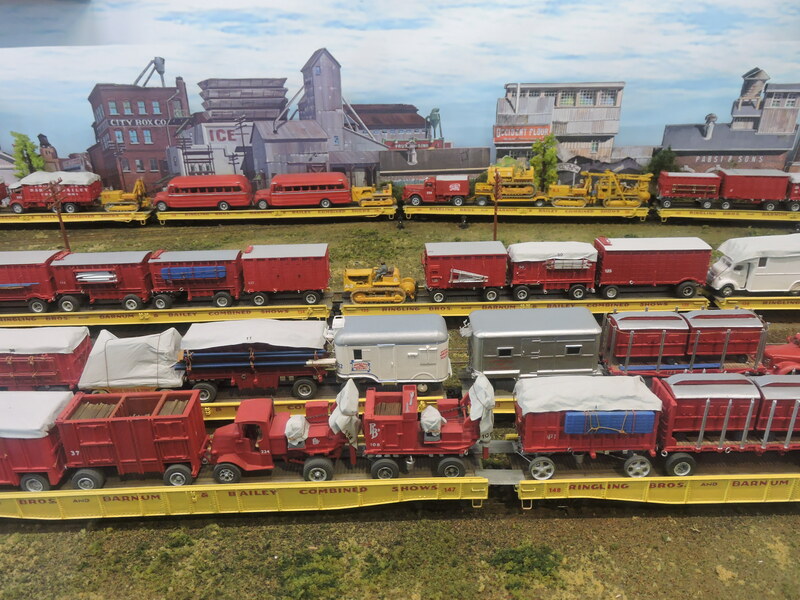 Mr. Kaspar’s model — four train sections, 108 railroad cars, 149 wagons and cages, 40 trucks and tractors, and 14 floats and carriages — now resides at the Circus World museum in Baraboo, Wisconsin. 1947 was the last year the train was painted red and yellow. It was also the last year 6-pole tents were used for the big top and menagerie. That year the train traveled 13,346 miles carrying 46 tents and the poles and ropes to support them, 184 horses, 39 elephants, and food to feed 1377 employees 3900 meals a day. Management and performers traveled in 18 coaches in the train’s forth section separately from the workmen. The first section had 3 stock cars, 18 flat cars and five coaches for workmen. The second section had 1 elephant car, 19 flat cars and 14 workmen’s coaches. The third section had 9 stock cars, 16 flat cars, and 14 coaches for workmen. Everything was designed for maximum efficiency in unloading. The draft horses even traveled in their harness to minimize time needed to get to work when they arrived. The harnesses were removed later when they were fed and watered. In addition to the people, the animals, and the equipment and rigging to put up the tents, the train carried a travelling city: wardrobe, tailor, sound and electrical shops; sanitation; the cookhouse and diners; stages, and circus rings; fuel trucks and buses; and customer seating. It was off-season, so the museum had few visitors. But we also had the depressing thought that fewer and fewer people are alive who saw the circus in its full glory — and therefore, probably there will be fewer and fewer people to care about the museum. This entry was posted in Travel Logs and tagged Circus trains, Circus World Museum, Craftsmanship, HO scale trains, model trains, Models, Travel, Wisconsin. Bookmark the permalink. Simply AMAZING!!! You seem to find the most interesting spots in our magnificent country! Glad you share them with us. Doug had a successful 2-week trip to France, training leadership principles to volunteer leaders in the Nantes area Baptist churches. He came back with a terrible cough though. Still trying to get better from that. Scott & family are coming here today from Danville to go to our annual Christmas production, “Virginia Christmas Spectacular.” They’ll come back again next Thursday to go with us to see “Amahl & the Night Visitors,” put on by the Music/Drama Depts at LU. My cousin’s son, 10, is Amahl. Mark & family will be here Dec 19-26 for Christmas. Would love to see you again! Thanks again Ray. I remember getting Shriners tickets to Barnum & Bailey many years ago as they traveled through Portland. I first saw part of it in his modest NJ basement just outside NYC. I think it was just a hobby for a guy who is really multi-talented. From Joe Kaspar: The only correction I have is about the source of material on the train’s logistics. That information came from the log of the shows 1947 General Manager, George W. Smith, not the conductor. BTW, the Emmy you mention was given to the NBC Engineering Dept., not just to me, for the work on the first television stereo broadcast. I was the project manager at the time. I have always admired the patience and dedication of individuals invested in model trains. Like circuses, they might become a thing of the past, unless some of today’s kids catch the bug. Your circus series is fantastic! We’re fortunate to have the opportunities to see the Ringling Brothers/Barnum-Baily Circus every year all those years ago while it still toured the country. The dad of a neighborhood friend of mine ran away to join the circus when he was a kid…but his dad went after him and brought him home. After he married and had kids, he became the local coordinator of the Shrine Circus – he finally got his circus fix.